On some Saturdays when we all were feeling lazy and didn’t feel like cooking a big brunch for the family, we would often drive to a nearby South Indian coffee house in Noida in search of some yummy food. 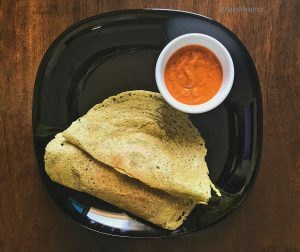 Lucky for us we once ordered their Saturday Special that was available only after 11 am – An Andhra special Moong dal dosa called Pesarattu paired with delicious Tomato Onion chutney. The dosas were stuffed with a loaded potato masala. And when I say loaded I mean that the Pesarattu filling even had cashews and raisins which were surprisingly delicious in this breakfast staple. 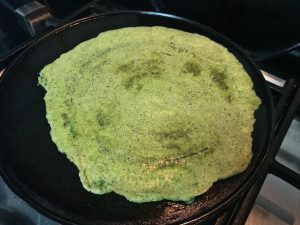 But since it was still a (moong dal) dosa, I thought that it would require fermentation and I was too intimidated with the process of making the batter from scratch. Previous attempts at making dosa batters haven’t always been successful. But one Friday afternoon, while reminiscing about weekends back home I started craving my future Saturday brunch and started researching. And lo and behold, I found that the Pesarattu batter requires no fermentation! So I geared up and started preparing for the Pesarattu already! 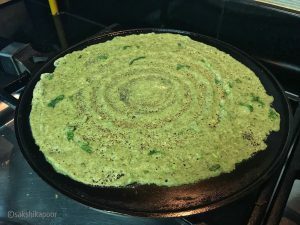 Pesarattu or a moong dal dosa is a kind savoury crepe made with the batter of split moong dal and sometimes whole moong dal. I usually have both these dals in stock. My mom makes a nice stir fry with soaked Split moong dal which I love eating as a snack or for breakfast. Once the split moong dal is soaked for a while, the peels start to come off and are the peels are particularly nutritious. Thinking of that lovely dal stir fry, I decided (on a whim!) that I was going to use both whole and split moong in equal proportions. Start by measuring the dals. Combine both kinds of dals in a big bowl and wash and drain till water is clearer. Add water and soak overnight or 5-6 hours. After soaking for at least 5-6 hours the dals will be softer. Drain the dals and the rice by keeping aside a little water. Prepare for the Pesarattu batter by roughly chopping ginger and green chillies. 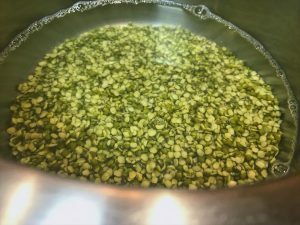 Transfer the drained dals and rice to a blender or food processor. Follow by adding green chillies, ginger, cumin seeds and salt. Add some of the reserved water to blend the dals into a paste. Avoid making the batter too thin though. Once the batter is ready, take out the batter in a big bowl. Next, wash and chop coriander leaves and add to the batter. Keep aside for use later. Prepare the Tomato – Onion Chutney till then. First of all, peel and roughly chop the onions and ginger. Wash and roughly chop the tomatoes and the green chilli (if using). Prepare the curry leaves by washing and draining them. After this, place a small pan or kadhai on medium high heat and add oil. Once the oil heats up (in about a minute), add mustard seeds and let them splutter. The mustard seeds will start jumping around soon and that’s your cue to add the chana dal and stir. Cook for around 30 seconds and then add the chopped ginger, curry leaves and green chillies. Stir and cook for another minute and then add roughly chopped onions. Let the onions cook for 5 minutes or till they are translucent. After this add in the chopped tomatoes next followed by salt and red chilli powder. Stir in the spices and let it cook on medium low heat till the tomatoes are mushy. You may add a few tablespoons of water at this time. This should take another 5-7 minutes. When the tomatoes are mushy you will start seeing a little bit of oil on the sides. That’s your cue to take this tomato onion mix off the heat and let it cool. Wait for the Tomato Onion chutney mix to cool down and then you can transfer the contents to a blender. Blend into a smooth paste. You may add a few tablespoons of water to blend but that depends on your mixie/blender. Now take out the chutney in a bowl and chill in the fridge till serving time. 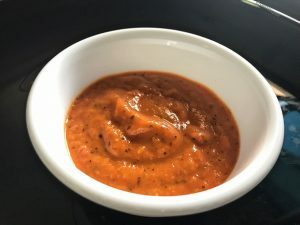 This easy tomato onion chutney is great with dosas, vadas and idlis! First, place a cast iron tawa/ griddle on medium high heat and wait for it to heat up. I keep a separate cast iron tawa for making dosas in which I don’t use too much soap while cleaning up. Instead I use salt and hot water. Also, because the tawa is seasoned I don’t need to use too much oil on the dosa. If you don’t have a cast iron tawa/pan, you may use a big (12 inch maybe!) non stick skillet but high heat doesn’t do much good for non sticks. I usually use sesame oil for making dosas. Sprinkle a few drops of oil and wipe them with a few kitchen paper towels to spread them evenly in a thin layer. I use this same paper towel to coat the surface again in between dosas. Heat the tawa and place a ladle of batter at the centre of the tawa and start spreading it into a circular pattern. The first dosa is always a tough one, so don’t be too disappointed. Let the dosa cook for a couple of minutes. You may sprinkle a few drops of oil on top. Also, you may cover the dosa with a lid to help it cook in the steam. I usually don’t cover it because I flip the dosa and cook on both sides. Once you notice the sides of the dosa are cooked, start to scrape gently to lift the dosa with a turner. Your turner should ideally be sharp/thin. When you see the dosa come off from the sides easily, flip it and cook for a half a minute more. If you’re not too adept at making thin dosas, your thick dosa may need to be cooked for slightly longer times. Once cooked, take the dosa off the tawa. I advise you to wipe the tawa surface with the same paper towel to prevent the batter from sticking. Subsequent dosas come out better usually. If your dosas are getting too crispy or brittle, you may want to reduce the heat, wait a couple of minutes, and then coat the surface of the tawa with the oiled paper towel again before putting more batter. Make a stack of dosas or serve them hot as they come off the tawa. You may add aloo masala on the dosa if you wish. We have an awesome Aloo Bhaji recipe for pooris that goes great with dosas of all kinds. You may also make the bhaji with boiled sweet potatoes. Measure the dals. Combine both kinds of dals in a big bowl and wash and drain till water is clearer. Add water and soak overnight or 5-6 hours. Do the same for the rice. Soak separately from the dals. Prepare for the batter by roughly chopping ginger and green chillies. 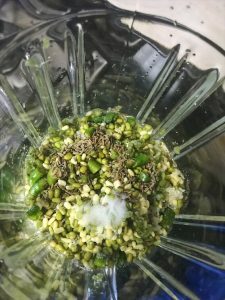 Transfer the drained dals and rice to a blender or food processor. Follow by adding green chillies, ginger, cumin seeds and salt. Add some of the reserved water to blend the dals into a paste. Avoid making the batter too thin though. Wash and chop coriander leaves. 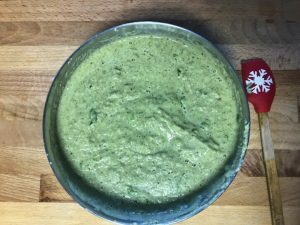 Add the chopped coriander leaves to the batter. Keep aside. Peel and roughly chop the onions and ginger. Wash and roughly chop the tomatoes and the green chilli (if using). 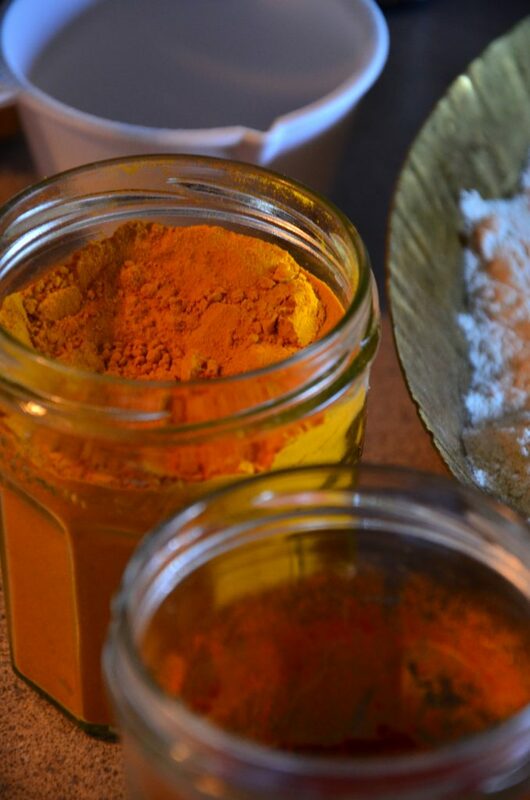 Wash the curry leaves and keep aside. Place a small pan or kadhai on medium high heat and add oil. Once the oil heats up (in about a minute), add mustard seeds and let them splutter. Once the mustard seeds start jumping around, add the chana dal and stir. Cook for around 30 seconds and then add the chopped ginger, curry leaves and green chillies. Stir and cook for another minute and then add roughly chopped onions. Cook the onions for 5 minutes or till they are translucent. Add in the chopped tomatoes next followed by salt and red chilli powder. Stir in the spices and let it cook on medium low heat till the tomatoes are mushy. You may add a few tablespoons of water at this time. This should take another 5-7 minutes. Once the tomatoes are mushy you will soon start seeing a little bit of oil on the sides. That’s your cue to take this onion tomato mix off the heat and let it cool. Once this mix cools down, you can transfer the contents to a blender and blend into a smooth paste. You may add a few tablespoons of water to blend but that depends on your mixie/blender. Take out the chutney in a bowl and chill in the fridge till serving time. Place a cast iron tawa/ griddle on medium high heat and wait for it to heat up. Before making the first dosa, sprinkle a few drops of oil and wipe them with a few kitchen paper towels to spread them evenly in a thin layer. I use this same paper towel to coat the surface again in between dosas. Once the tawa is hot, place a ladle of batter at the centre of the tawa and start spreading it into a circular pattern. The first dosa is always a tough one, so don’t be too disappointed. Let the dosa cook for a couple of minutes. You may sprinkle a few drops of oil on top. Once the dosa comes off from the sides easily, flip it and cook for a half a minute more. If you’re not too adept at making thin dosas, your thick dosa may need to be cooked for slightly longer times. Subsequent dosas come out better usually. I keep a separate cast iron tawa for making dosas in which I don’t use too much soap while cleaning up. Instead I use salt and hot water. Also, because the tawa is seasoned I don’t need to use too much oil on the dosa. If you don’t have a cast iron tawa/pan, you may use a big (12 inch maybe!) non stick skillet but high heat doesn’t do much good for non sticks. You also may cover the dosa with a lid to help it cook in the steam. I usually don’t cover it because I flip the dosa and cook on both sides. If your dosas are getting too crispy or brittle, you may want to reduce the heat, wait a couple of minutes, and then coat the surface of the tawa with the oiled paper towel again before putting more batter. Serve these Pesarattu/ Moong Dal Dosas hot with the tomato onion chutney and some Filter Coffee!